To prevent red beets from turning pink or white when canning: Leave 1 or 2 inches of the taproot and stem on the beets. Boil the beets until the skins slip off easily. Drain, remove skins and trim off the taproots and stems. The beets should now keep their red color when canned. The ability to metabolize the red pigment in beets, betacyanin, is a genetically controlled trait. People who inherit two recessive genes pass the pigment in their urine. When buying fresh beets, choose small beets and cut the tops off right away leaving about 2 inches of the stem. The greens draw moisture from the root. Store unwashed in an open plastic bag or one with holes, for 7 to 10 days. Beets are available year-round. Beets are sold both bunched with the tops attached, and by weight with the tops removed. It easier to tell the freshness with the tops attached, although even with wilted tops the roots may be alright if they are firm. 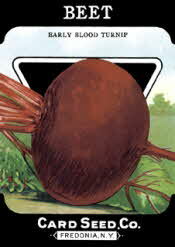 Look for beets that are firm, round, with a slender tap root, a rich deep red color and smooth surface. AVOID: elongated beets with round scaly areas around the top surface - they will be tough, fibrous and strong flavored. Avoid wilted flabby beets, they have lost too much moisture. 1 pound of beets without tops gives 2 cups of cooked beets. 2 to 3½ lbs. are needed to make 1 quart of canned beets. 1¼ to 1½ lb. will make 1 pint of frozen beets. 1 bushel (52 lb) will make 35 to 42 pints of frozen beets. Storage - Beets: Remove the tops 1 to 2 inches above the beet. Keep refrigerated in the vegetable crisper or in plastic bags or containers to prevent wilting due to to loss of moisture. Use beets within 1 to 2 weeks.